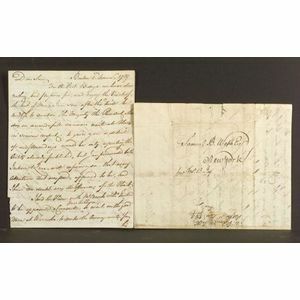 (Washington, George, Presidential Tour), Autograph letter signed, from a Mr. Joseph Barrell to Mr. Samuel B. Webb, dated Boston, November 1st, 1789, seven pages, an ebullient and fact filled itinerary of Washington's New England tour in 1789, "For the last ten days we have done nothing but prepare for, and enjoy the Visit of the best of men...I had the honor...to be appointed a committee from the town to wait on the good man at Worcester," (minor browning and chipping). Note: Joseph Barrell was a wealthy Boston merchand and staunch patriot. 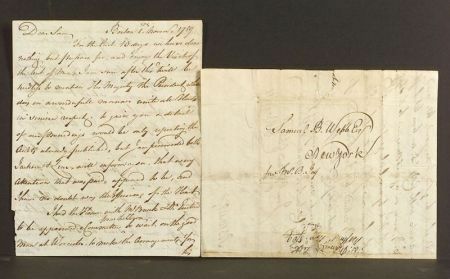 The recipient, Samuel Webb, was a friend of Washington and veteran of the American Revolution.